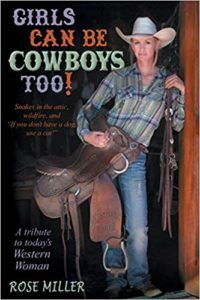 Today, Feathered Quill reviewer Diane Lunsford is talking with Rose Miller, author of Girls Can Be Cowboys Too! FQ: Thanks very much for your time today Ms. Miller. This book checked all the boxes for me when it comes to a great read. While you address early on what inspired you to tackle this project, I’m curious if there was one trigger that launched your creative juices to get flowing. Could you elaborate further? MILLER: I think writing is more in my blood than I realized. I enjoyed writing my previous books because they were about my life with my animals, and the stories just flowed. This would be a totally different project because I had to find the gals, (not too easy) travel to them if needed, think of questions (I had never done interviews before) and then write. The writing was the easiest because I wrote them as a conversation just as it occurred. So basically, I couldn’t help myself! FQ: I love the diversity you paint between the personalities of horses and their counterparts in the mule. Of all the four-legged beauties you’ve owned, what is one of your fondest experiences of owning a mule? MILLER: Rather than one experience, I think it is a special mule: Susie Q. She was the fourth mule I purchased in my quest to find the perfect mount for my old age. I had been showing Tennessee Walking horses and since they were “showy” they usually were not the best for trail riding. Retirement came about because I lost my young girls that helped me. First my daughters, then the other young gals got married, or went to college. Trail rides beckoned. Susie proved herself to be that nearly perfect mule. 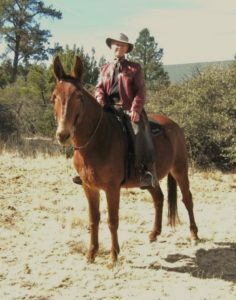 I have owned her for twelve years now; she moved to Arizona with us (along with 2 horses and 2 other mules) and allowed me to explore the Arizona countryside near our home, alone. Usually riding by yourself in the vast open spaces is not recommended, but with Susie, I felt safe, and indeed she has never done anything remotely dangerous in those twelve years. She is a true treasure. FQ: I was taken by Mary’s philosophy in your book (and addressed the passage in my review). What was your a-ha moment in your life that led you down the path of your equestrian lifestyle? MILLER: I think you are referring to Mary’s question in her poem: Have you ever had a dream or goal...I think I, along with hundreds of other women, was born with the “horse gene.” We have to have horses. I wrote about my quest to become a horsewoman in my first book: The Horse That Wouldn’t Trot. I had the desire, but needed my dad to get my first horse when I was sixteen, and my husband’s blessing to pursue my goal after we were married. So maybe no “a-ha” moment per se, it was there the very first time I saw a horse as a child! FQ: There is such a wonderful diversity in the women you depict in your book. How often do you connect with them and what made you decide on the women you did choose to write about? Are there any others you have met since publication that have a unique story to share? MILLER: A few like Kim McElroy are neighbors, and I get organic beef from her, and visit when I can. Because it is Arizona, the space separating us is large, so even neighbors are not close by. However, we do keep in touch via email, and Facebook. I cast my net far to find the ladies to interview, mostly by word of mouth, and that is why the book ended up being such an eclectic collection of stories. I only interviewed two women that I did not use. I was searching for “stories” not just about their lives, perhaps because that is what I love to read. It is also how the book: Girls Can be Cowboys Too! became such a large (500 plus page) book. I did not have the heart to discard any, and yes, I have met more inspiring ladies. There could be a Part Two! FQ: I have great admiration for the women in your book including Amanda Marsh and her story of the brave Hot Shots who lost their lives in the infamous Yarnell Hill Fire. It saddened me greatly to watch the movie fashioned after this event. How difficult was it for you to put Ms. Marsh’s story into words? MILLER: First, thanks for seeing the movie! I hope many more will do so after reading her story. Second, I was so honored that Amanda was willing to tell me her story. She is really a private person and this was a tragic event in her life, so I was surprised but so grateful she shared. Third, she made it easy to write as she is a beautiful speaker, she needed no prompting; she just told her story. There was one thing she asked: Do not have it be the most important or “keynote” story. When it came time to put all the stories in order, I realized after reading hers again, that nothing could follow it. I sat in awed silence. It was the closer. I cried as she told the story, and again as I wrote it, not because of the horrific loss of her husband and best friend, but because of the love story she shared. Not just of first love, Eric Marsh, but the second love of her life, Jason. Their unselfishness and total love simply overwhelmed me. I probably would not have gone to see the move, Only the Brave, but after she shared how much making the movie helped her heal, I wanted to. After we watched it, and as others also related, there was just total silence in the theater, many cried as this was local, and the hotshots were known to many of us. FQ: This book has terrific pace. Was there ever a time when you had to set your pen down because you ran out of creative flow? If so, how did you rally and continue writing? MILLER: I actually had many days of putting the pen down between interviews and write-ups, but never ran out of creativity because the next story was waiting to be told. The gals were terrific and we had a blast. FQ: It must be difficult to pinpoint one place as being your favorite in the majestic land of Arizona. If you had to choose, where would that be and why? MILLER: It is cliché, but it would have to be the Grand Canyon. We take family and visitors there now and then and it has never gotten “old.” After you park your vehicle and walk up to it, bam! There is that awesome vista, it gives me goose bumps every time and sometimes tears as I gaze upon what God has wrought. 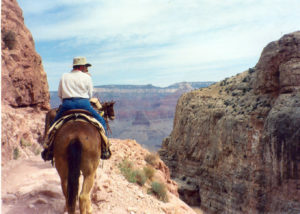 I had the opportunity to ride down to the bottom with a group, spend the night and ride back up on one of the Grand Canyon mules. That is when I fell in love with mules, hastened home and began buying my own! I wrote about that experience and my burgeoning love of mules in Mules, Mules and More Mules. So not just the Grand Canyon, but mules! FG: In line with Question 7, what is one of the most notable experiences you have had on horseback in the back country of Arizona and why this event? MILLER: It would have to be riding down the Canyon on a Grand Canyon mule. His name was Charlie, and he was the slowest darn mule in the bunch. I kept lagging behind, a cardinal sin in Canyon mule riding. Bob was with me and he wasn’t a rider at that time, more of a passenger. The story is a good one. We got to see the Canyon from top to bottom, it took five hours of strenuous riding because it was downhill and hard on the knees and body, then uphill to come back and darn, it was hot, and Charlie lagged even worse coming back up. Still I was hooked on mules because they were careful, self preserving (not stubborn as believed) and hard working. I wish I were in physical shape to do it again, but guess I will have to stick with riding my Susie on level ground these days. Some people I know have ridden the Canyon on their own mules, but I wouldn’t want to do that; I would choose one that “has been there and done that.” Some of the trails were frightening and some turns downright scary. FQ: It’s difficult to single out any of these amazing cowgirls in your story because each of them is so unique. I was in awe of Kimberly and her bull riding experiences on her bull Jazzy. Have you ever saddled up and ridden a bull? If so, please share your experience. If not, would you ever? MILLER: Well, that is funny because yes to a cow, not a bull. When I was growing up in Pennsylvania on our farm, we had Jersey cows. Dad was a school teacher, Mom stayed at home. Cows were useful; a horse was not, so no horse. I did have this most precious Jersey calf that grew into a wonderful milk cow. My sister and I tried riding her, but her backbone stuck up as dairy cow’s do and it was not fun. We did hitch her to wagons, though. Eventually, Dad relented and both I and my sister got horses! 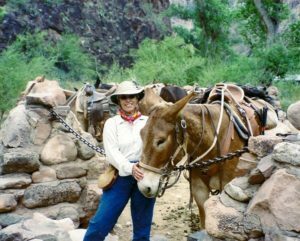 FQ: Janet Gabrielson is your mule buddy. I enjoyed reading about the resentments mules can harbor if something doesn’t sit well with them. Please share one of your most notable moments with your mule and its obstinance and how you overcame the situation. MILLER: This is an ongoing situation and how it ends is not known at the moment, but I am sure it will be wonderful. Eleven months ago I began having hip issues which eventually turned out to be bone on bone, and a replacement was suggested. Because of winter weather and the pain, I hung up my bridle, pursued different treatments because I did not want hip replacement surgery and all that goes with it. Long story short: that was impossible, so a month ago I had the surgery which has turned out to be a blessing, and I am recovering nicely. But during that year, I couldn’t ride or even be safe around my mules. Apparently, Susie took it personally because she became aloof and uncooperative, definitely not my perfect Susie. She pouted. The other two mules and my horse never changed. My feelings were hurt, but I guess hers were too. My animal communicator said that Susie was perfect because of me, we were a pair, we nurtured each other, and we were on the same wave length. When I quit doing things with her, she became despondent, just hanging out wasn’t enough. She also has become more jumpy. That has to stop because I want to start riding again and a jumpy mule and a new hip don’t go together. I will chat with my animal communicator again, and now that I can walk and stand without a cane, I can groom and fuss over her. Treats seem to help too, bribery is good. We need to reconnect, but I am sure we can! FQ: It was an absolute pleasure to read and review your book. You have a tremendous command of your pen. I can only hope you are working on your next book and if so, are you able to share a sneak peek. MILLER: Not sure about another book, may retire with this one. I really love this book, and I can say that because it is not about me this time. The women are truly awesome. I love this book—oh, did I say that already?